Maintaining the facial fuzz can be quite a task. An even arduous task is choosing all the right tools for accomplishing shaving in the most perfect way. You need at least a quality razor, a soft shaving brush, a well moisturizing and exfoliating shaving cream and a good pre- and after-shave lotion. Instead of going through various brands and their products, (and in the process ending up confusing yourself over which brand or product to choose! ), some men choose the smart way and settle for a quality shaving kit. That totally makes sense. You don’t have to rattle your brains; someone else has already done the work for you and present all the quality shaving tools in one kit. So all you got to do now, is choose, right? Hold your horses though. Even choosing a good shaving kit can be quite a headache! That is why we have assembled a list of some fantastic top 5 best shaving kits (not in any specific order) just for your convenience. Read them below! An exemplary male grooming gift set. Edwin Jagger is a company that specializes in manufacturing shaving products, and their expertise is reflected in this product. It consists of three hand-assembled shaving tools. 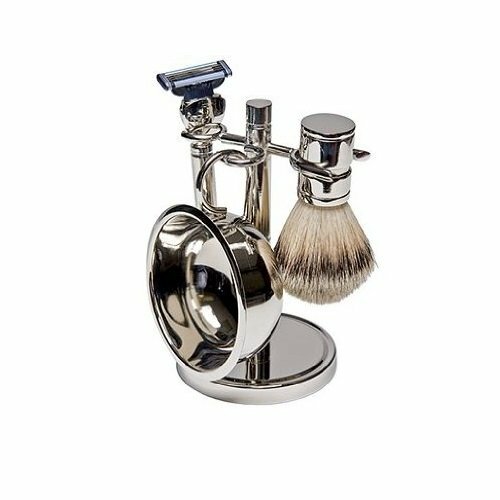 First, a very elegant shaving kit stand made of nickel-plated brass and polyester. Second, a high quality safety razor with Gillette Mach 3 blades. and finally, a magnificent shaving brush made of pure badger hair. Even though the brush is not exactly the best ever made by Edwin Jagger, it certainly looks (and acts) the part in this collection. Definitely worth a try! Parker is well known for offering quality shaving tools, at very decent prices. This particular piece isn’t any different in that regard too. Contained within this excellent shaving set are – a Pure Badger Bristle Brush, a Parker 71R Safety Razor and a very classy Shaving Kit Stand. The Parker 71R safety razor comes encased in a solid brass frame, and is considered to be among the best shavers in the market currently. The safety razor is fitted with a closed comb safety bar, and so easily avoids any injury risks for the user while shaving (unlike other d double-edged safety razors). This beautiful set is made complete by a dense deluxe shaving brush made entirely of badger hair with an elegant knot; and a compact and sturdy shaving kit stand. Excellent shaving results are guaranteed with this set! A very stylish 4-piece shave set, wrapped in a silver coating is presented for you by the famous Harry D Koenig brand. The best part about this set though is its incredibly affordable price, that makes it an ideal choice for beginners who have just started shaving. A plastic razor handle that is compatible with the Gillette Mach 3 cartridges is provided, along with a natural boar bristle shaving brush and a sturdy shaving kit stand. A shaving bowl for lathering completes this artistic set with very contemporary designs! An eternal classic. Merkur’s products are loved by men worldwide because of their ease of use, excellent quality and high durability. This shaving set carries forward the same tradition with aplomb. The Merkur 38C safety razor has a long and heavy chrome-plated handle, that allows for a greater control and makes it safer to use. 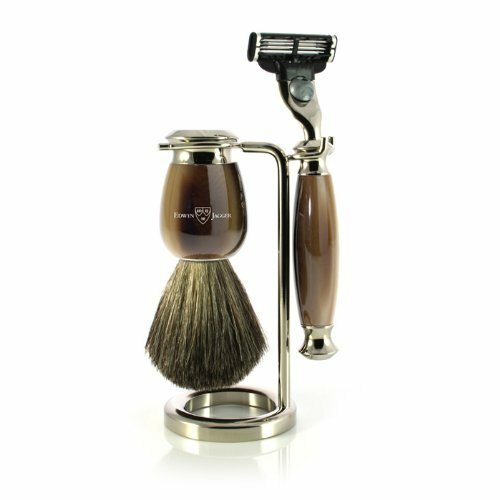 The shaving brush by Royal Shave is made of 100% pure badger hair and comes with a black PB3 silvertip, along with a stylish razor stand from 30 Degrees Shaving. A bowl of Taylor of Old Bond Street Luxury Shave cream and a 10-pack Merkur Double edge razor blades complete this stunning set. It will look great on your bathroom counter as well as provide that excellent shave to you. Highly recommended! A premium all-in-one kit. 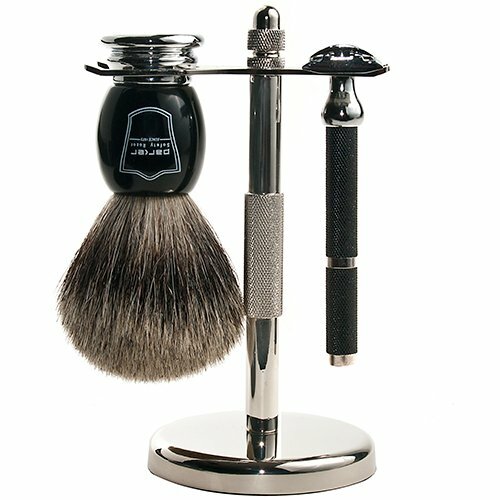 The Royal Shave Black and Chrome Shaving set leaves no room for complaints. It is a complete product replete with fantastic shaving products and features. Enclosed is an excellent Edwin Jagger DE86 safety razor with a metal handle. The razor has a safety bar with scalloped closed comb, which means you can easily shave without any risk of cutting yourself. The entire razor has got a very nice feel to it and sits nicely in the hand, giving it a greater amount of control and precision when required. A Royal Shave PB3 shaving brush with natural boar bristles is also provided, that makes up excellent lather while shaving. 5 packs each of Wilkinson Sword and Derby blades, along with a Lemon & Sandalwood shaving soap and Royal Shave shaving mug and stand complete this must-have shave set.